Mary Eaton was born in Oxford in 1780 and baptised at St Aldate's Church on 26 April. She was the daughter of Deodatus Eaton of St Aldate’s and Mary Slatter who were married at St Peter-in-the-East Church on 27 July 1776. Mary's four siblings were also baptised at St Aldate's: Paul Eaton (1779), Catherine Eaton (1782), Ann Eaton (1785), and Deodatus Eaton (1788). Her husband William Hazel was born in Sotwell, near Wallingford, Berkshire in 1773 and baptised there on 25 August. He was the son of William Hazel senior of Sotwell and Hannah Weston, who were married at St Nicholas's Church in Abingdon on 22 March 1770. He was matriculated at the University of Oxford from Pembroke College on 3 November 1789 aged 16, and gained his B.A. in 1793. He was then ordained Deacon on 18 December 1796, and Priest on 24 December 1797. On 3 November 1802, just before his marriage, he was appointed Curate of Crowmarsh Gifford. died at Sotwell at the age of four on 6 May 1813 and buried there on 13 May. Henry Hopkins Hazel (born in Wallingford, Berkshire in 1819 and baptised at Crowmarsh Gifford on 1 July). Twins? From 22 June 1803 to 3 June 1807, Mary's husband William Hazel was Assistant Curate at Benson, and their children James and Mary were born there. On 21 February 1814 Hazel was appointed Curate at Newnham Murren Chapel (a hamlet of Crowmarsh Gifford, Oxfordshire that is on the opposite side of the River Thames to Wallingford, which was then in Berkshire, with the two linked by a bridge). He was granted permission to live in Wallingford, Berkshire (which was within one mile of the chapelry), as there was no parsonage house at Newnham Murren. Hence his youngest five children were born in Wallingford. On 5 August 1820 Hazel was appointed Curate of North Stoke, a village that came under Crowmarsh parish. Their eldest son William Hazel was matriculated at the University of Oxford from Christ Church at the age of 17 on 15 February 1821, and was ordained Deacon on 24 December 1827 and Priest on 21 December 1828. Their second son James Hazel was matriculated at the University of Oxford by The Queen's College at the age of 17 on 23 October 1821. He was ordained Deacon on 21 May 1826, and Priest on 24 December 1827. On 5 August 1824 at St Peter’s Church, Wallingford, Mary Hazel (19) married George Parsons Hester (26). In 1826 Mary's husband ceased to be Curate at North Stoke, and his son James Hazell was appointed in his stead for one year. They continued to live in All Hallows parish, Wallingford. In 1838 (registered third quarter) in the Abingdon registration district, James Hazel married Eleanor Rabone Dewe (born in Milton, Berkshire). Mary's husband William Hazel died on 19 March 1832 at the age of 58 and was buried at Sotwell, probably in a family vault, on 26 March. At the time of the 1841 census Mary (61) and her unmarried daughter Jane were living at Victoria Road, Summertown in the home of her son Edward Hazel (22), who was a solicitor. They had one servant. On 9 May 1844 at St Giles's Church, Oxford, Jane Hazel of North Parade married James Hazel, born in Brightwell Baldwin, the son of the gentleman James Hazel, and probably a relation, who was then a gentleman of Harwell, Berkshire. Ann Hester Browning (26), the daughter of the ironmonger Jonathan Browning. At the time of the 1861 census Mary Hazel, a widow of 81, was still living at North Parade, again accompanied by her daughter Sarah Anne (41), plus their servant. The following year that street was taken into the new parish of Ss Philip & James. In 1871 Mrs Hazel (90) was living at 6 North Parade, and as well as her daughter Sarah (54) her granddaughter Susan Trollope (19) was staying with her. † Mrs Mary Hazel née Eaton died at 6 North Parade at the age of 95 on 5 October 1875 and was buried at St Sepulchre’s Cemetery on 8 October (burial recorded in the parish registers of Ss Philip & James's and St Giles's Church). 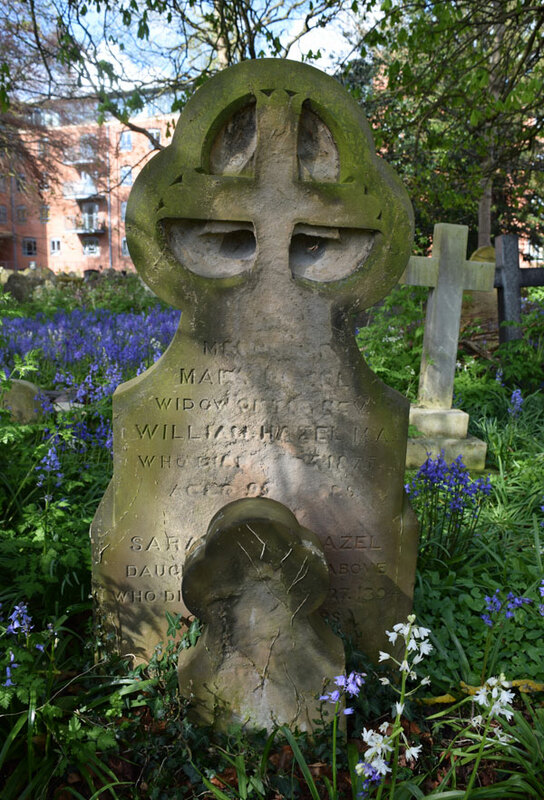 † Miss Sarah Anne Hazel died at 58 Holywell Street at the age of 78 on 27 February 1894 and was buried at St Sepulchre’s Cemetery on 3 March (burial recorded in the parish register of St Giles's Church). Her effects came to £1,150 0s. 1d., and her executors were her son Edward Wells Hazel, who was a solicitor, and her nephew Edward Walsh, described as a gentleman. William Hazel junior (born 1803) was Chaplain of Christ Church from 22 June 1826 to 22 December 1831. From 1840 to 1855 he was headmaster of Portsmouth Grammar School. At the time of the 1841 census William and Jane were living in Penny Street, Portsmouth and two of his Hester nephews were living with him and were probably pupils at the school. In 1851 William (48) and his wife Jane (48) were at the same address with six of their other nephews (three were sons of his sister Mrs Mary Hester and three of his sister Mrs Catherine Walsh). By 1861 William Hazel junior was Rector of St Peter's Church, Wallingford, and at the time of the 1851 census he was living at Wood Street there with his wife Jane. He remained Rector there until his death at the age of 64 on 28 October 1867. His effects came to under £4,000, and his executors were his wife Jane and his brother Edward Wells Hazel, who was a solicitor. His wife Jane moved to Sotwell, and died there on 12 May 1878. James Hazel (born 1804) was appointed Curate of North Stoke on 23 December 1827 and of Pishill on 6 December 1830. He was the incumbent of Nettlebed in Oxfordshire from 1843. At the time of the 1851 census James (46) and Eleanor (35) were living in Nettlebed with one servant, and the situation was the same in 1861. He died at Nettlebed on 18 October 1865. His effects came to under £1,500, and his executors were his wife Eleanor and brother William. Catherine Eaton Hazel, Mrs Walsh (born 1807) was living over the shop at 41 Queen Street, Oxford in 1851 with her husband William Walsh, who was a chemist & druggist, and their children George Walsh (6), Susan Catherine Walsh (4), and Frederick Walsh (2). Their three elder sons John Walsh (14), Edward Walsh (11), and Herbert Walsh (9) were living with Catherine's brother William Hazel in Portsmouth and were probably pupils at his school. In 1861 Catherine (50) and William (64) were at the same address with their sons Edward (22), who was a chemist, and Herbert (20), who was an articled clerk. They became more prosperous and were able to build Norham House (the present 58 Banbury Road), moving in In 1867, and in 1871 Catherine and her husband William (74), who was now retired, were living at there with their daughter Susan (24) and their son Albert (19), who was an undergraduate at Oxford, plus their two servants. In 1881 Catherine (73) and her husband William (84) were at the same address with their son George (36), who was a cotton broker, and as well as two servants they now employed a nurse, who was probably looking after Catherine's husband, who died just after this census. Mrs Catherine Eaton Walsh died in Oxford at the age of 75 on 14 March 1882. Her effects came to £1,101 10s., and her executor was her son William. Their daughter Susan Catherine Walsh married the Oxford lawyer John Worrell Carrington, later knighted and Chief Justice of the Supreme Court of Hong Kong. Elizabeth Bunce Hazel, Mrs Trollope (born 1811) was living in the village of South Stoke in 1841 with her husband John Trollope and their children John (9), Edward (8), Amelia (6), Fanny (5), Mary Ann (3), and Eleanor (1). By 1851 her husband was the Rector of Crowmarsh Gifford, and they were living their with four more children: Alice (7), Frances (50, Henry (3), and Lucy (1). They were there in 1861 with two more children: Susan (10) and Thomas (5).They were still living at Crowmarsh Rectory in 1871 with four of their grown-up children. In 1881 Elizabeth, a widow of 70, was living at St Martin's Street, Wallingford with the same four children. Mrs Elizabeth Bunce Trollope died at Wallingford on 24 December 1890. Her personal estate came to £3,156 4s., and her executor was her daughter Mary Anne Trollope. Jane Hazel, Mrs Hazel (born 1812) was living in Harwell in 1851 with her husband James Hazel, who was a farmer of 150 acres employing 27 labourers, and their children James junior (5), William (3), Mary (2), and Albert (one month), plus three servants. In 1861 they had a 230-acre farm in Sutton Courtenay, and two more children, namely Sarah (8) and Robert (3); and their niece Eleanor Hester (9) was paying a visit. Jane appears to have died before the next census. Henry Hopkins Hazel (born 1819) worked as a chemist in Portsmouth, and a notice in the Hampshire Advertiser & Salisbury Guardian of 22 July 1843 announced that the partnership between Hazel and William John Hay, chemists & druggists, was being dissolved. In 1851 Henry (32) was still single and living over his shop at 8 Belgrave Street, Portsmouth. He is hard to locate after that date.